PINless dialing service allows users to make cheap long-distance / international calls from their mobile or landline phones without entering a PIN by simply dialing an access number. When a user signs up for your PINless dialing service, you register their phone number in the system and provide them with the access number they must dial. Then, when the user makes a call, the system recognizes their CLI (ANI), informs the user about their balance and asks them to enter their destination number. · A user purchases a PINless dialing calling card. You enable ANI authentication and auto registration options for your Prepaid card calling application. When the user dials their access number for the first time they are asked to enter their PIN number and offered to register their ANI. From then on, they are only asked to enter their destination, entirely skipping the PIN number entry step. This document describes how to provide PINless dialing service by creating dedicated PINless dialing accounts. Let’s say, Amanda Doe signs up for your PINless dialing service. You add her mobile number 16041112222 as a PINless dialing account and provide her with a service access number. When Amanda dials the access number from her mobile, she hears what her current balance is and is asked to enter her destination number. After she dials the destination number, the system informs Amanda about the maximum permitted call duration and connects the call. When the call ends, the system deducts the correct amount from Amanda’s balance. Also, Amanda is granted access to the self-care portal, so she can keep track of her calls on her own and top up her balance as necessary by using her credit card. If you have just installed the PortaSwitch® software or dedicated a new billing environment to configure the services described in this handbook, make sure to first perform the initial configuration of PortaSwitch®. To do this, use the Initial Configuration of PortaSwitch® handbook. · Conditions which are applicable to every call regardless of the called destination. · Name – Type a short name for the tariff object; this is the name you will see in the select menus (for example, GlobalNet Termination). · Service – Choose Voice Calls here. · Routing – Leave the Routing option enabled for this tariff. Rates are per-destination prices. Please refer to the Call Billing Parameters section in the PortaBilling Administrator Guide® for more details on billing parameters. Managing rates online is very convenient for maintaining existing rate tables, as well as for reference purposes. In the case of new price lists or major updates, the offline method is better. · Destination – Select a destination prefix from the list or type it in directly, e.g. 420 for Czech Republic. · Route category – You can split your available routes into several categories, such as “High quality,” “Premium,” etc., then create routing plans for your customers. Use the Default route category for now. · Preference – The routing priority for the specific destination. 10 is the highest priority, 0 is the lowest (i.e. do not use this destination for routing at all). For now, you can just set all of your vendor rates at preference 5, and the system will organize available routes according to cost (LCR). · Huntstop – When enabled, instructs the system to not try any routes with a lower preference. · Interval first – Type a first billing unit in seconds. 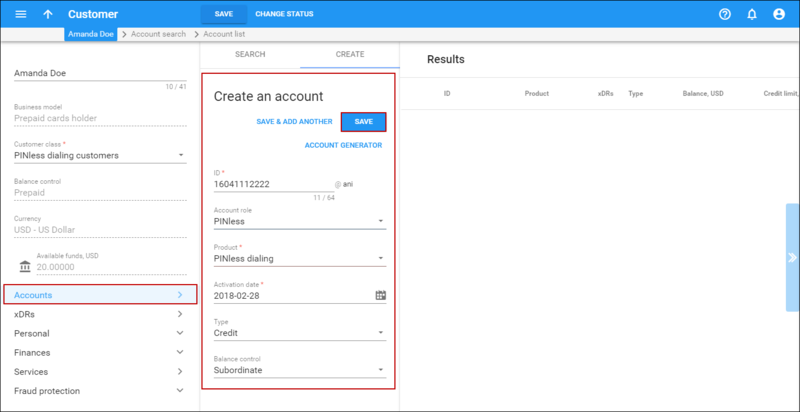 · Interval next – Type the next billing unit in seconds. · Price first – Type a per minute price for a first interval. · Price next – Type a per minute price for the next interval. NOTE: Off-peak fields appear only if this tariff has already been assigned an off-peak period on the General info panel. · Effective from – If you want this rate to take effect sometime in the future, you can either type in a date manually, or use the calendar. NOTE: When using the calendar, you can specify that the date you are entering is in a different time zone than your present one. PortaBilling® will then automatically adjust the time. You also can upload rates from a file in .csv, .xls or .xlsx format – please consult the Rate Import handbook for more details. Perform the Create Tariff and Enter Rates steps described above until you have created a tariff with the termination costs for each termination partner you have; these tariffs are created as “Applied to: Vendor”. This step is only required if you have not entered information about your vendors into the system before. Vendors are your termination partners or the providers of incoming toll-free lines and DID numbers. · Name – Type a short name for the vendor object; this will be used on the web interface (for example, GlobalNet). 4. Repeat these steps to add more connections to this vendor. Since the main purpose of this service is to give your customers access to your prepaid application from PSTN (by dialing your access number from their landline or mobile phone), you have to ensure that calls to that access number are delivered properly to your network and then handed over to PortaSIP® Media Server. 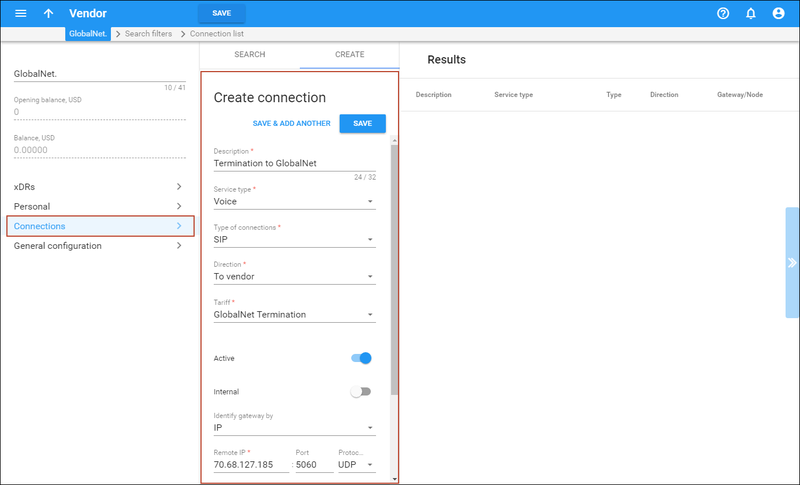 Please refer to the instructions in the Incoming Calls from PSTN section for complete details about how to set up the vendor and the connection. 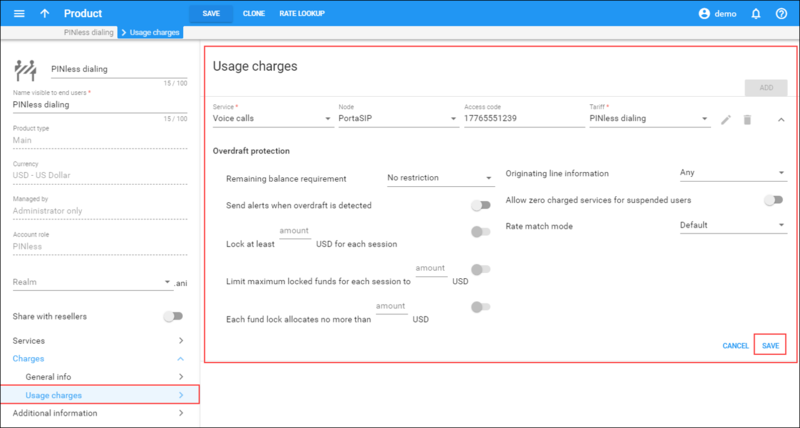 First you need to define that when a call is made to the access number of your prepaid calling card service, PortaSIP® launches the corresponding IVR application for handling the call. Set up the IVR Application for the virtual PortaBilling® environment where you use this application. · Name – specify the IVR application’s name (e.g. PINless dialing). · Entry point – Type your prepaid calling card access number. Click to add more Entry points. 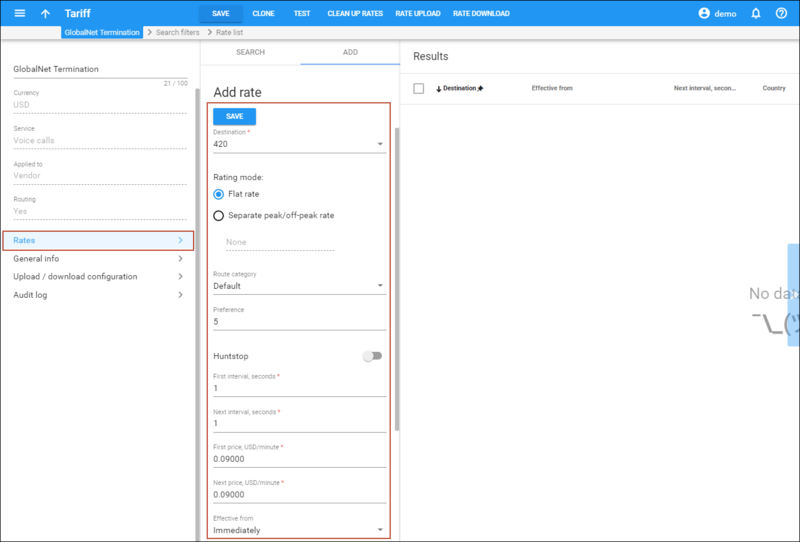 Of course, you can clone multiple entities in order to customize the application parameters (such as IVR languages or whether ANI authorization is performed), according to your requirements. In order to support PINless dialing, the prepaid application should have the ANI authentication feature enabled. Then if the ANI number of the incoming call matches the ID of an account, this account is the one placing the call (and will be charged when the call is completed). The customer will immediately be asked to enter a destination, skipping the PIN entry step. 1. On the Voice application panel, go to the Authentication, Authorization, Accounting section and select Authentication. 2. 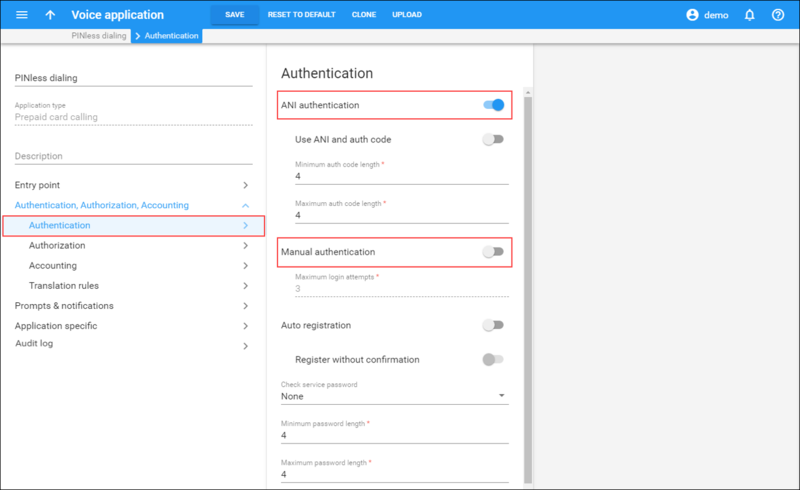 On the Authentication panel use a slider to enable ANI authentication feature. NOTE: The Manual authentication option must be disabled for this scenario. · “Normal” SIP accounts. When someone in your network dials the number, the system will recognize that the call should be delivered to one of the IP phones connected to PortaSwitch® – and will never be sent out to the PSTN. · ANI accounts. The situation here is exactly the opposite: when someone in your network dials this number, the call will be sent out to the PSTN. 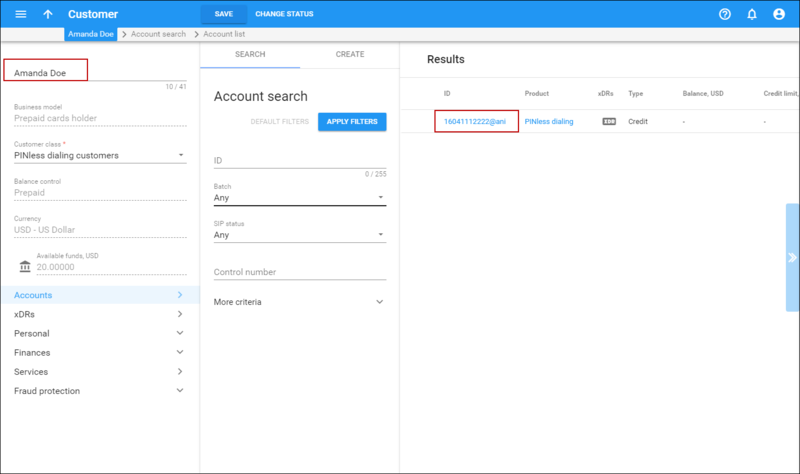 In order to avoid confusion between these two types of accounts (which may result in calls being routed improperly) and allow both your administrators and the PortaBilling® routing engine to clearly distinguish between ANI accounts and regular SIP accounts, the PINless account role has been introduced. When you create an account with the PINless account role, PortaBilling® automatically adds the suffix '@ani' for your ANI authentication accounts. For example, if you would like to allow your customer to use his cell phone with ANI 16041112222 for ANI authentication, you would create the PINless account 16041112222@ani for this customer. You can also set up the ANI translation rule as a regular expression in the ANI translation rule field. 1. On the Voice application panel, go to the Authentication, Authorization, Accounting section and select Translation rules. 2. On the Translation rules panel type s/$/@ani/ in the ANI translation rule field. This will instruct the system to add @ani suffix to the ANI number of the incoming call and search for a ANI@ani account (e.g. 16041112222@ani) for authentication and authorization. Configure in which languages the IVR will communicate with the customer. 1. On the Voice application panel, go to Prompts & notifications and selectLanguage. 2. Click the Select languages button to launch the dialog box for the language selection. 3. In the Select languages box, choose the language (or several languages) you wish to use for voice prompts. In this case, the IVR’s first prompt will be the language selection prompt “Please press 1 for English, 2 for Russian, 3 for German, etc.” To choose all languages at once, select the line All available on top. Then click the Select button. You can also change the languages order by moving icon up and down. 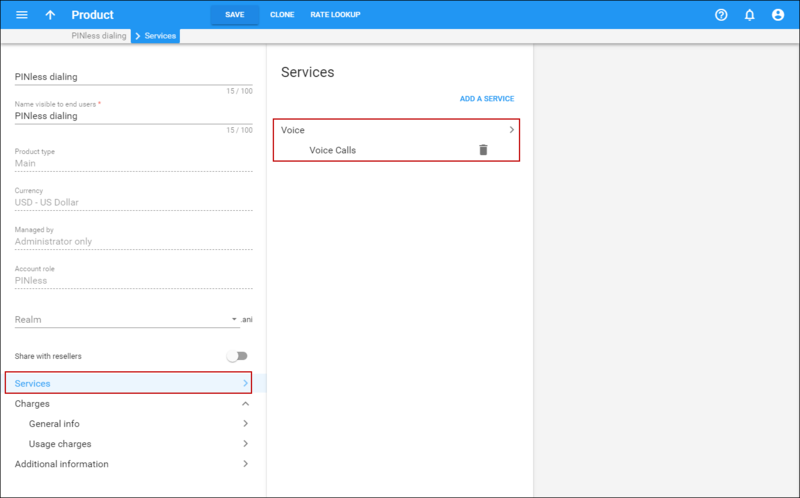 Configure the IVR application to use your brand prompts instead of default ones. Please refer to the How to Configure Custom Brand Prompts section for a detailed configuration description. See the APPENDIX A. PortaSIP® Media Server IVR Applications Preferences section of the PortaSIP® Media Applications Guide to read more about the prepaid card IVR configuration parameters. NOTE: There is a helpful tool-tip for each option. Just point your mouse to the desired option to invoke it. · Name – Type a short name for the tariff object; this is the name you will see in the select menus, (for example, SIP Phone Subscribers). 4. On your customer tariff’s panel (PINless dialing), click General info. · Destination group set – If you wish to enter rates in the tariff not for every individual prefix, but for a whole group of prefixes at once, you should create a destination group set and destination groups beforehand. Leave this select menu empty for now. · Round up to, decimal places – Instead of calculating xDRs with a 5-decimal-place precision, round up xDR amount values (e.g. to cents, so that 1.16730 becomes 1.17). · Default formula – Default rating formula, which will be applied to every rate created in the tariff. If you leave this empty, the “old-style” rating will be used. · Short description – Type a short tariff description. This will be shown in the rate lookup on the admin interface and the self-care pages for your accounts and customers. 1. 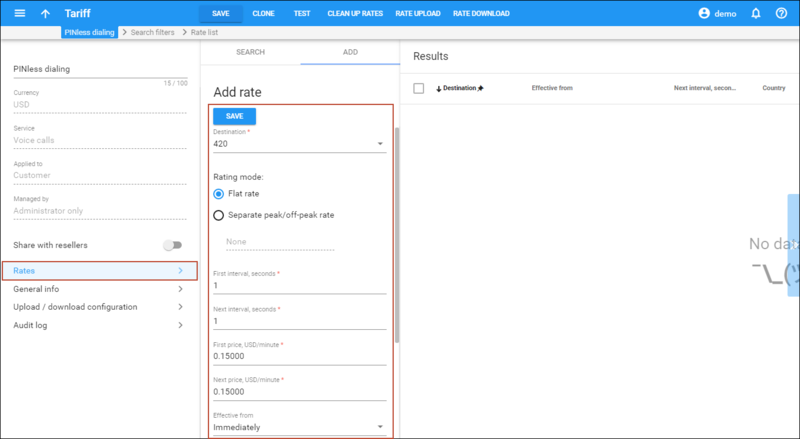 On your customer tariff’s panel (PINless dialing), click Rates. · Destination – Select a destination prefix from the list or type it directly, e.g. 420 for Czech Republic. · First price – Type a per minute price for the first interval. 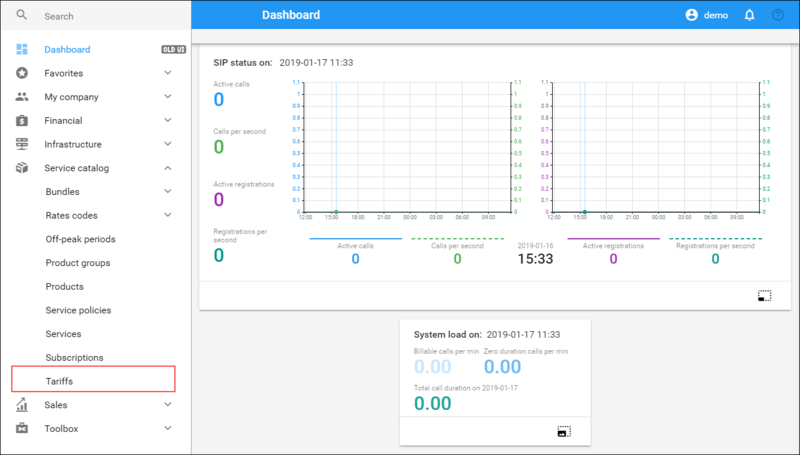 · Off-peak first interval – Type a first billing unit in seconds for off‑peak time. · Off-peak next interval – Next billing unit in seconds for off‑peak time. · Off-peak first price – Type a per minute price for first interval for off‑peak time. · Off-peak next price – Type a per minute price for next interval for off-peak time. · Rate formula – Type a custom rating formula. 4. Repeat these steps to enter more rates. 1. 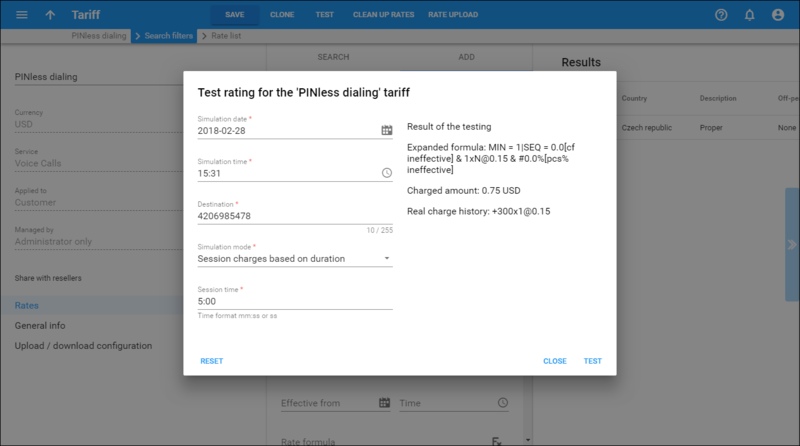 While on your customer tariff panel, click Test. 2. Type in the phone number for which you would like to test the rating, as well as the estimated call duration, and then click Test. Prepaid cards will be issued for a specific product. Products are a powerful feature that defines different ways to bill an account. Product definition is always done in these steps: product definition, service definition and configuration, and creation of the rating list. 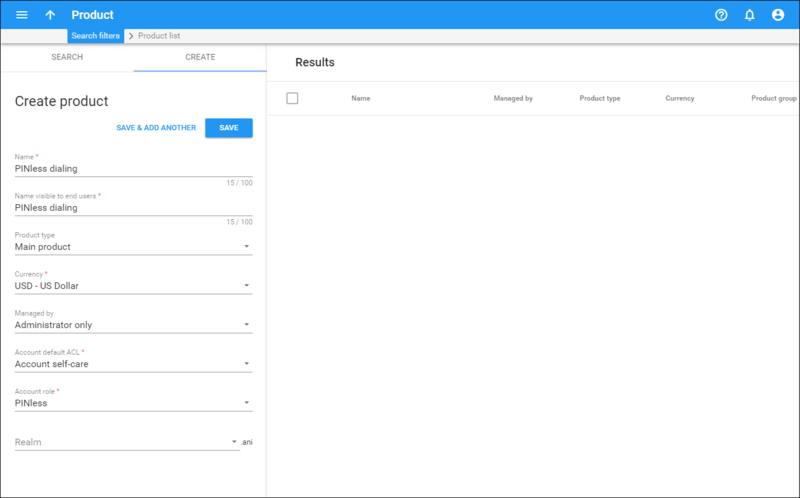 · Name – Type an internal product name that will be shown on the administrator interface. · Account role – Select PINless from the list. · Access code – Type the access number that you have added for the IVR application. (e.g. 18665552288). · Tariff – Choose the tariff that will be applied to your prepaid calling card customers. NOTE: If you use several access numbers for the IVR application, you must add a rating entry for each of them. · Business model – Select which customers this customer class will apply. Select Prepaid cards holder from the list. A customer is an owner of accounts. The customer’s contact information is used to distribute account usage information, call statistics, invoices, and so on. Since PINless dialing is a prepaid service, in this example we will describe how to create a prepaid customer. · Business model – A business model defines what type of service is to be provided to the customer. Select Prepaid cards holder for this customer. · Customer class – Customer class allows you to define a policy for automated payment collection. By choosing a specific class here the customer will automatically inherit all of the class properties (grace period, invoice template, etc.). Select the previously created customer class (PINless dialing customers). · Balance control – Select Prepaid. · Available funds – Specify the amount a customer has paid you when signing up. An account identifies the end user who uses the service. In the case of the PINless dialing service, the account is a PINless account with a unique @ani suffix. 1. On your customer panel, click Accounts. · ID – Type the customer’s mobile number (e.g. 16041112222). · Account role – Select PINless. · Product – Select the product you just created (PINless dialing). · Activation date – Leave the default value as is. The account will immediately be activated. · Type – Select Credit. · Balance control – Select Subordinate. Amanda can now use the service. Give Amanda the customer self-care portal credentials (login: amandadoe, password: yUS867) so that she can keep track of her calls, balance and top up her funds on her own, as needed.